It all began yesterday when I gave my kids a major Mummy Lecture. I sat them down in the living room and asked them in low but firm tones whether they’ll stop fighting with each other or not. Two pairs of rather large eyes stared at me, looking like the world had come to an end. I didn’t stop there. I went on to lecture them about the appalling state of their rooms and how I was FED UP of tidying after them. At the end of the lecture, promises were made that rooms would be cleaner and that they’d be nicer to each other. Half an hour later, I heard whispers coming out of my daughter’s room, indicating that a serious closed-door meeting was going on. The whole afternoon after that my kids were nauseatingly nice to each other. I nearly barfed but let it be. Better this peace than the screaming banshees they become when fighting like idiots. All said and done, I thought of it no more and was actually calculating they’d go back to Square One within hours but just a short while ago they stunned me and had me in fits of laughter. I came across a list of Dos and Don’ts, accompanied by agreements they’d signed to adhere to these self-imposed rules. 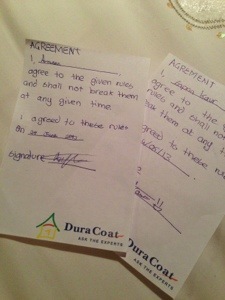 I haven’t stopped laughing & I’m sharing the pictures of the agreements with you. I love my little fools! It’s only been a day, but are they following it? Nice 🙂 Maybe this is something I should try! Always better to let them make their own rules and get on with it. 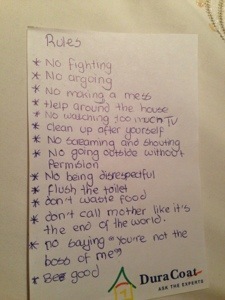 When they do break a rule, they choose their own punishment so it’s not like I’m the horrid ogre in their life. Try it and let me know how it goes.